ROCKAWAY BEACH — The multimillion dollar bathrooms and lifeguard stations placed along city beaches as part of a post-Hurricane Sandy fix have already begun rusting and leaking, DNAinfo New York has learned. The city spent $105 million to place the 35 modular units, which were designed by Garrison Architects and built by Triton Construction, along beaches on Rockaway Beach, Staten Island and Brooklyn in the wake of Hurricane Sandy. Of the 35 stations, 21 are lifeguard shacks, 10 are public bathrooms and four are used for maintenance and operations, according to the Parks Department. 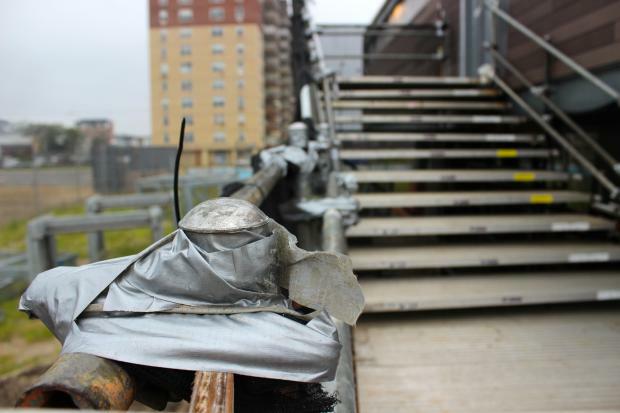 But while the shacks were intended to be strong enough to withstand the next superstorm, those who have used them say they are already falling apart — including at least one structure that has duct tape securing its railings for the handicapped-accessible ramp. Photos shared with DNAinfo show the units — some of which are public bathrooms and others that are lifeguard stations — lined with rust and beginning to show wall cracks before the summer has even finished. “The insides are starting to rust and they leak all over the place,” said another lifeguard who works out of a shack on Rockaway Beach. The structures were commissioned by the city's Department of Design and Construction, which approved them in January and began installing them close to the beach opening, a DDC official said. In a statement, the DDC admitted some temporary materials were used in order to get the "essential lifeguard and comfort stations ready for the beach season." “We will also be performing some cosmetic work, including refinishing portions of the stainless steel surfaces on the modular units,” the spokesman said, saying that work will continue on the structures after Labor Day. The DDC hasn't even finished installing all of the units, leaving two of the pricey bathrooms under a tarp in an empty lot a block from the beach more than a month after delivering them there. Those shacks will be delivered to their permanent home near Beach 66th Street in the fall, after the beach season is over, the Parks Department said. The condition of the structures baffled the district manager of the local community board. "When you look at them, they’re rusting. And for over $30 million they spent in Rockaway, I think the city got ripped off by about $29 million,” said Jonathan Gaska, district manager for Community Board 14 in Rockaway. UPDATE: On Friday afternoon, the DDC sent DNAinfo New York a video showing a department employee scrubbing a portion of a unit with a Clorox wipe and a sponge. They said the cleaning shows it’s “not rust, just dirt — which likely adhered to adhesive left behind from when the pieces were wrapped in plastic for delivery,” a spokesman said.